In beginning after having knowledge of C, C++ and PHP, when I was suppose to select one of the prime programming languages among different languages, I was very much puzzled. Every language has its own specialty and strength. But after some browsing and studying, I select Java to be the best for me. There are different reasons that encourage me to select Java. Everywhere I read, they usually write about other reason for selecting the Java, but first thing that hit on my mind for java is, it’s free. Not only language, required applications for Java programming are also available at freed of cost. The second reason that came in my mind is that, after having the knowledge of object oriented Java will be easy to use and learn. After having some programming experience, one will not find Hard to master. Today OOP is the main strength of any programming language. Whereas Java support pure object oriented programming. It is said in for Java that “Everything is as object”, which define the level of Object Oriented in Java. The object model in java programming is easy to extend. Both of the problems have been solved by the java programming by providing the output as bytecode instead of executable code. Bytecode is a highly optimized set of instructions designed to be executed by Java run-time system, which is called the Java Virtual Machine (JVM). As written above, java is required to be interpreted for execution. And interpretation obviously takes some time, which will make it relatively shower than the executed code. But in the case of Java, due to the HotSpot JIT (Just In Time) compiler execution will be very much fast. 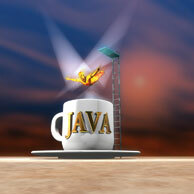 The tools required for the Java application development are easily and freely available in web. The IDEs like Eclipse and NetBeans and as well as web server like Tomcat and Application Server (JBoss, Glassfish, Geronimo etc) are easily accessible in web at free of cost. While designing Java, the ability to create robust programs was given a high priority. To get reliability, Java restrict in few key areas, to find out the mistakes in our program development. It checks compile time error as well as runtime error. And the errors messages are very clear. Java is designed to develop the requirement of real-world, of creating interactive network programs. For this purpose, Java support multithreaded programming, which will allow do run multiple process at once. It does programming for desktop GUIs application, mobile application, electronic application, Web user interface etc. Java is designed for the distributed environment of internet, because it handles TCP/IP protocols. It provides features from intra-address-space messaging. This allowed objects on two different computers to execute single procedure remotely. This feather is available in a package called Remote Method Invocation (RMI). Today’s enterprise applications required to support HTML, SQL and XML. Java has good support for all of these built in and we can get third-party libraries for free, that make these even much easier and better. The language is getting mature much and more rapidly. MySQL is the free database available in internet. Because of the compatibility of java with PHP, the web application cost will be very much reduced. Currently, there are more than 6.5 million software developers who are attracted by this language. Due to use of java in every major industry segment and presence in a wide range of devices, computers , networks etc. · And many Set-top boxes, printers, web-cams, games, car navigation systems, lottery terminals, medical devices, parking payment stations, and more. At Last I would like to advice you, let’s dive into java.. you will fall in love with it.